A farming town, Bruce Rock produces crops of wheat, barley, lupin and peas. Sheep, pigs and goats are also farmed in the area. The Bruce Rock Museum comprises of a historical display in the restored Bank with adjoining reconstructions of an original one-roomed school, a typical mud brick settlers hut and a blacksmiths shop. An arts and crafts centre is located in the main street displaying a wide variety of work by local artists. A new Art Gallery The Old Club Gallery features work by Wheatbelt Artists. Located in the main street is the Federation Amphitheatre, designed and built by the local community. A performance or function setting, the amphitheatre has an adjoining sculpture park offering visitors a peaceful stroll around the interesting garden. Bruce Rock celebrated its Centenary in 2013 with a community project that records the history of the district, its people, farming and business enterprises and social life. The Centenary Pathway is bordered by a mosaic slab wall stretching the length of the main Street created by residents proud of their heritage. The nearby bank at Shackleton is said to be Australia’s smallest bank and is also worth a look. Kokerbin Rock, located 45 kilometres west of the town, is an immense granite outcrop. It is the third largest monolith in Australia and is recognized as an interesting unspoilt spot for flora and fauna study. It covers 9 hectares and is 122m high with interesting formations, caves and a deep well on the western side. From the summit you can enjoy spectacular views over the surrounding countryside. To protect the fragile environment of Kokerbin Rock, camping facilities are now available at the historic townsite of Kwolyin 9kms south. Toilets, campers kitchen, BBQ and covered seating areas available. 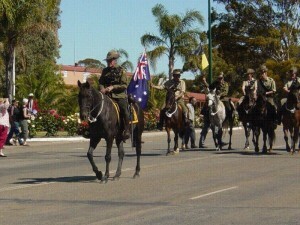 Bruce Rock is becoming famous for its Back to the Bush Veterans Reunion Week held in October each year. Thousands of veterans from all over Australia travel to Bruce Rock to enjoy the camaraderie of this community event. For more information go to www.brucerock.wa.gov.au/. Local arts and crafts including Jams, honey, cakes and slices, knitted clothes, scarfs, blankets and woodentoys. No LPG available in Bruce Rock.